Quick, easy and cheap to make this soup will warm you up on a winter’s evening and is packed with flavour and an added chilli kick. 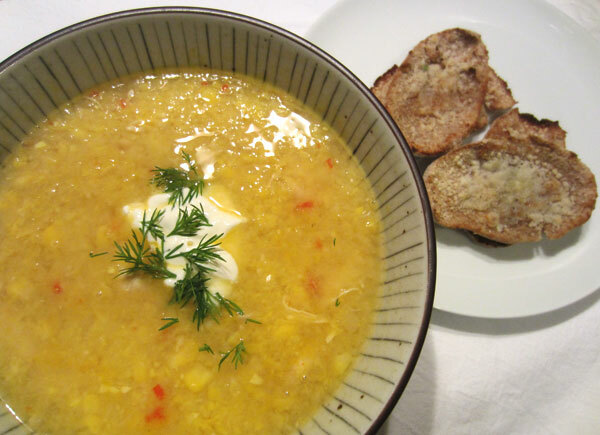 The dill and lemon make it really fresh and go so well with the chicken and corn. You can make it veggie by using vegetable stock and omitting the chicken, substituting tofu would also work really well. Heat the oil in a fry pan and fry the chicken breast over a medium heat until cooked through. Set aside. Heat the butter and garlic in a large saucepan over a medium heat until golden, add the chilli to the pan and fry for a couple of minutes. Add the corn and stock and bring to the boil, then simmer for 10 minutes. Transfer two-thirds of the soup to a food processor and blitz to a coarse purée then add back to the pan. Or blend in the pan with a stick blender. Shred the chicken with your hands into thin strips and add to the pan. Squeeze in the juice of one lemon and season generously with salt and pepper. Serve with a spoonful of crème fraîche and some chopped dill. Halve lengthways mini wholemeal pita bread. Spread each with butter and sprinkle with finely grated parmesan cheese. Grill in the oven until golden brown.